Voyages (1985), the first part in Marc Karlin’s extraordinary Nicaraguan series, comprises of stills by the American photographer Susan Meiselas. Between 1978 and 1979, Meiselas captured the two revolutionary insurrections which brought the FSLN to power in Nicaragua, overthrowing the fifty year dictatorship of the Somoza family. The film is in the form of a letter, written by Meiselas to Karlin. Through her own words, the film interrogates the responsibility of the war photographer, the line between observer and participant, and the political significance of the photographic image. The film is composed of five tracking shots, each approximately ten minutes in length. Shot in a studio by Karlin’s cinematographer, Jonathan Bloom, the camera glides slowly over Meiselas’ blown up stills, shifting focus between images in the background and foreground, allowing the editing to be achieved in camera. The mediative camera movement accompanying Meiselas’ words, creates a distance for the audience, reflecting the photographer’s own separation from the events she witnessed. The studio space was a form Karlin used repeatedly, layering his films with structured, contemplative intervals in between segments of exterior observation. 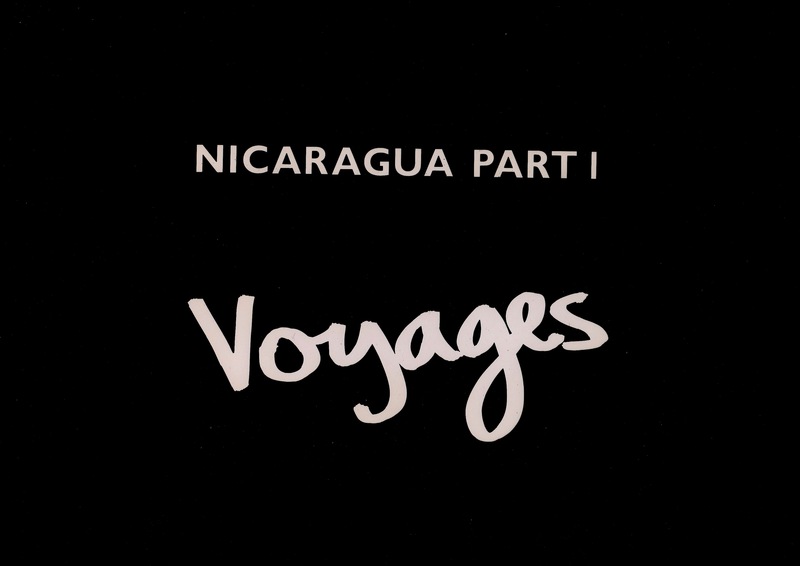 A new cut of Voyages will be shown this Friday at the Return to Nicaragua event. When broadcast by Channel 4 in October 1985, the film drew criticism due to the fact that Meiselas’ words were narrated by a British actress, whose RP delivery lends the film an unwanted class distinction. A letter from the archive explains Karlin’s decision. Originally, Karlin wanted to narrate the film. This was strongly objected to by Alan Fountain, the commissioning editor of Channel 4’s The Eleventh Hour, on the grounds of feminist politics – it was a women’s experience therefore a woman should read it. Karlin disagreed, feeling that after the popular revolution, men and women should be able to work together, and not be seen as appropriating a women’s experience. Karlin went back to the drawing board and produced three choices, 1. to get Meiselas to read the letter out herself. 2. To get an American to play Meiselas. 3. To get an English woman to read the letter. Karlin adamantly stated the original intention of the film was that the letter would be read out by the receiver, rather than the writer. If he used Meiselas’ voice, it would be the sender’s voice addressing the images rendering the film one-dimensional. If he used an American voice, the same objections regarding the sender/receiver objections would come into play. So, Karlin opted for a female, English voice; albeit one that connoted privilege, running contrary to progressive politics at the time and the new found pluralism of Channel 4. Recently in the archive, a recorded voiceover by Marc Karlin was discovered on a umatic, and after a discussion between Susan Meiselas and Hermione Harris, Karlin’s partner, it was decided Karlin’s voice would narrate the film.